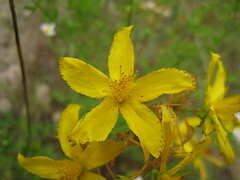 St John’s wort has been used medicinally since the time of Hippocrates. Even during the Renaissance and Victorian periods in Europe and England, it was used for the treatment of mental disorders and nerve pain. It was also used as a sedative and a treatment for malaria, as well as a balm for wounds, burns and insect bites. St John’s wort is one of the four herbs that have been proven effective in reducing stress and anxiety. The other three are Licorice Root, Passion Flower and Lavender. St John’s wort has been shown to be more effective than Prozac (according to a recent study) in treating major depressive disorders. Today it is used by many for treating depression, anxiety and sleep disorders such as insomnia or restless leg syndrome. This herb is a bright cheerful plant with five petals and gland dotted yellow flowers. It is the flowering tops of St John’s wort that are used to prepare teas, as well as capsules and tablets containing concentrated extracts. It is often combined with valerian root when insomnia or restlessness are accompanying symptoms. • Anxiety, mild to moderate depression and nervous tension. • Insomnia and other sleep disorders. • Menopausal disorders as well as premenstrual syndrome PMS. • Treating inflammation of the stomach and intestines and against internal worms. • In homeopathy for pain relief and to combat inflammation caused by nerve damage. • Treating locally as an antiseptic and analgesic on burns, bruises, sores and deep wounds with nerve damage. • To treat sprains, tennis elbow and cramps. In addition, macerated oil can be made by steeping the dried material in carrier oil such as wheat germ or olive oil. This macerated oil is then used to treat wounds and burns. • Not to be taken by those suffering from very severe depression or in conjunction with certain drugs such as antidepressants, birth control pills, Cyclosporine, Digoxin, Idinavir and other HIV antivirals, Irinotecan and other cancer drugs plus Warfarin and related anticoagulants. It can even clash with other herbs or supplements. It is therefore safer to contact your health care provider if you are taking other products or drugs before commencing with St John’s wort therapy. • Internal use of St John’s wort at a high dosage may result in skin sensitizing and photo toxicity when exposed to the sun particularly in fair skinned people. But for the most part St John’s wort is a natural home remedy for the treatment of several conditions. In many countries, it is commonly prescribed for mild depression, especially in children, adolescents, and where cost is a concern.